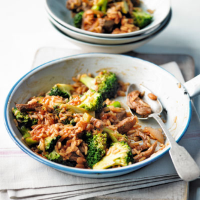 A sweeter take on a quick and tasty stir fry. 1. Cook the rice in boiling water for 12–15 minutes until just tender, then drain. 2. Meanwhile, heat the oil in a large frying pan and fry the beef and onion for 5 minutes. Add the broccoli and fry for 3 minutes. 3. Mix together the tomato purée, soy and honey and add to the pan with the rice. Stir well to combine and serve.